Attention any and all moms out there: Carrie Underwood is more like you than you may think. While she may be an American Idol winner and country music superstar, the proud mom knows the power of multitasking. 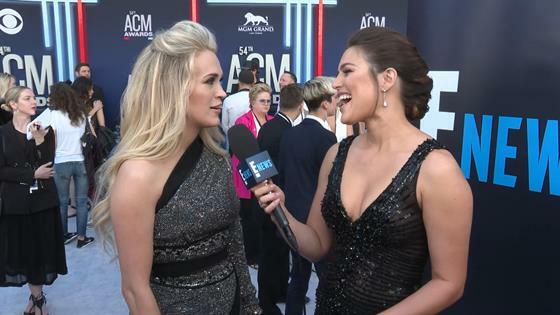 It certainly was put on display Sunday night before she walked the red carpet at the 2019 ACM Awards in Las Vegas. Before showcasing her Nicolas Jebran gown outside the MGM Grand Garden Arena, Carrie decided to pump while getting glammed up. "Getting ready for my performance.......also pumping," she shared on Instagram. "#Multitasking #ACMAwards #Southbound #LetsDoThis." The post immediately got a positive response from followers and famous fans including Vanessa Lachey who commented, "Always GORGEOUS." Carrie's trainer Erin Oprea added, "GORGEOUS, and Real!!!! Mom life at its finest!!! Go crush your performance." It was a big night in Las Vegas for the country singer who was nominated for Female Artist of the Year. But along for the ride was husband Mike Fisher who was more than happy to support his leading lady. "#datenight #acms," the hockey player shared on Instagram after snapping a selfie from his seat.